They say that ambrosia and nectar are the foods of the gods, but I think sweetened condensed milk has to be pretty close to the top of that list as well. In the United States, this sticky-sweet concoction is only occasionally consumed, and even then, it is primarily reserved for baking purposes. However, sweetened condensed milk is much more widely consumed throughout the world and enjoys particular popularity in Russia. 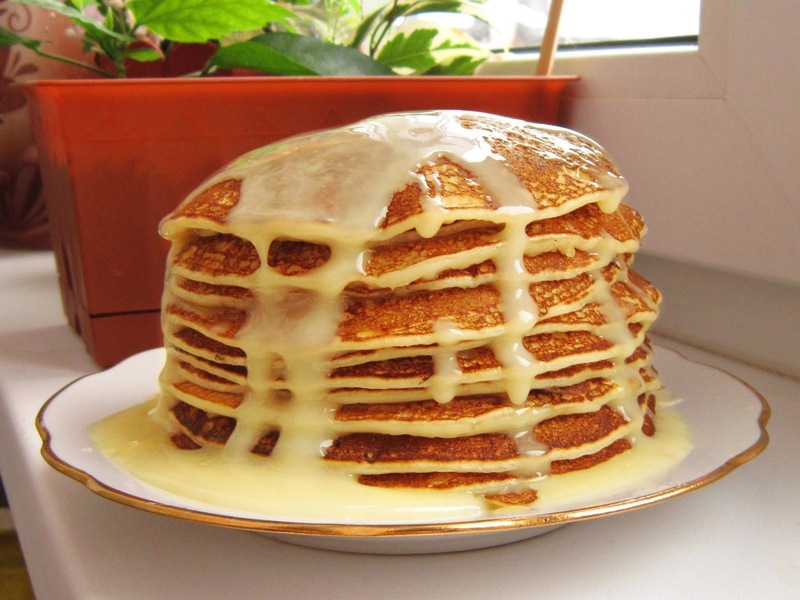 Russians have invented all sorts of creative and delicious uses for sweetened condensed milk (or sgushenka/ sgushyonnoye moloko): they pour it over over blinchiki, spread it in between waffle-like wafers, use it as the “glue” that holds muraveinik anthill cakes, mix it in for honey cakes, use it as fillings for various commercial cakes and candies…the list goes on and on. An especially popular use for sweetened condensed milk involves boiling it – in the can itself – for a few hours, which transforms it into a caramelized spread called varyonoe sgushyonnoye moloko similar to dulce de leche. However, this can prove to be a daunting challenge with potentially dangerous (and messy!) results if the can explodes! Yet no matter what the usage, sweetened condensed milk is a beloved mainstay in kitchens all over Russia. How did sweetened condensed milk garner such popularity in the first place? First, let’s look at how sweetened condensed milk was originally developed. Marco Polo noted that Tatar groups perfected a precursor to condensed milk: “they have milk dried into some kind of paste to carry with them, and when they need food they put this into water…[it] dissolves, and then drink it.” However, sweetened condensed milk in its current, most well-known form was invented in the nineteenth century. Nicholas Appert first “evaporated and preserved milk by heat in a sealed container” in 1810. In 1856, Gail Borden patented a sweetened condensed milk process that utilized heat, sugar, and vacuum pressure that made milk portable, storable, and long-lasting; his invention was an effort to combat food-borne illnesses that stemmed from poor refrigeration and food storing methods at that time. Sweetened condensed milk sales had their first major boost during the American Civil War and quickly gained a reputation as a wartime staple. At the same time, it spread out to international markets, where it also helped alleviate problems with food preservation and distribution. In the case of Russia, its first sweetened condensed milk-producing factory was constructed in Orenburg in 1881. Its popularity really took off during the tumultuous wars that characterized Russia in the first half of the twentieth century (particularly World War II), when supplies of food ran short, resulting in a demand for long-lasting, durable food products. It remained a common treat in Soviet times, especially when chocolates and candies were in short supply. Gradually, it became an endearing symbol of blissful sweetness throughout the USSR. Today, sweetened condensed milk has lost some of its edge due to the wider variety of goods available in Russia’s post-Soviet open markets, but it is still enjoyed by young and old in the country. Sweetened condensed milk has earned a well-deserved place as one of Russia’s most beloved treats. Many reasons can be attributed for this status: given that the Tatars first created condensed milk, and the fact that the Tatars and Russians have had a long and rich history of cultural interaction, perhaps Russians view themselves as “pioneers” of the product. Perhaps it is a symbol of wartime hardships or a consistent sweet spot in times of uncertainty and depravity. Whatever the explanation, I think all can agree that condensed milk is delicious, and it will continue to sweeten up Russians’ lives for years to come! History of Condensed Milk.” Ichnya Condensed Milk Company. Ichnya.com, 2009. Web. 12 Nov. 2014. <http://www.ichnya.com/en/page/show/information/milkhistory/&gt;. Kipfer, Barbara Ann. The Culinarian: A Kitchen Desk Reference. Digital image. Books.google.com. Google Books, 11 Apr. 2012. 145. Web. 12 Nov. 2014. Moskin, Julia. “Milk in a Can Goes Glam.” The New York Times. The New York Times, 02 Mar. 2010. Web. 12 Nov. 2014. Parfitt, E.h. “The Development of the Evaporated Milk Industry in the United States.” Journal of Dairy Science 39.6 (1956): 838-42.Archive.lib.msu.edu. Michigan State University, 1956. Web. 14 Nov. 2014. Polo, Marco. “Chapter IX: Manners and Customs of a Strange People-Concerning the Tatars and Their Ways- The Origin of Condensed Milk.” Ed. Noah Brooks. The Story of Marco Polo. N.p. : Century, 1897. 86-93. Print. Schneider, Edward. “A Twist on Condensed Milk.” Diners Journal A Twist on Condensed Milk Comments. The New York Times, 27 Mar. 2008. Web. 14 Nov. 2014. <http://dinersjournal.blogs.nytimes.com/2008/03/27/a-twist-on-condensed-milk/&gt;. Trowbridge Fillapone, Peggy. “Why Early Canned Milk Was Initially Rejected By The Public.” About Food. About.com, n.d. Web. 12 Nov. 2014. “Из истории сгущенки, история сгущенного молока.” Из истории сгущенки, историясгущенного молока. Upakovano.ru, 3 Mar. 2009. Web. 12 Nov. 2014. <http://www.upakovano.ru/articles/1874&gt;. We thank The Department of History and Politics for its generous financial support for The North Star Reports and The Middle Ground Journal. I’ve only ever considered condensed milk to be used for cooking. I didn’t consider it’s uses outside of baking. Now that I think about, I doubt I’ve ever tasted condensed milk by itself… Hopefully, when I visit Russia next summer, I’ll be able to try it. Is amazing to learn how some sweet as condensed mil are also very popular in several countries besides mine! In Colombia, we also love condensed milk. We make all sorts of deserts, cakes, we even it eat with coffee and jelly. Is probably one of the treats I miss the most form home. Is amazing how even though Russia is miles away Colombia, they have that in common! What an interesting article to read! I did not know that condensed milk can be a popular treat in some countries. I have learned a lot about it and its importance to Russian people. It is incredible how a certain type of food can be a cultural benchmark for some people,like in this case, the Russians.Thanks for sharing!!! It was really interesting to read about the history of sweetened condensed milk as well as its role is Russian culture. I remember sweetened condensed milk from a seven-layer bar recipe that my mother makes, but learning about some of the other uses makes me want to try sweetened condensed in other ways! Wow that is amazing that they use it so much for so many things I never thought about it as the Russians do. I think that my family has only used it for baking that’s about it. That is incredible to learn different ways to use condense milk. I though this was crazy how many ways and also how many different ways you can use this. Like the comments above I believe my family has only used this for cooking and thats it. Its crazy to see and also learn the many different ways. I can understand, kind of why it is only used for baking here in the US. I tried it once and I thought that it tasted weird but I think that we only use it for baking and not drinking because we have so many sweet things in our diets already. Condensed milk may be more popular over there because their food palettes could be quite different from ours. I do find it fascinating though. It’s interesting how quickly condensed milk made its way into the sweet tooth of Russia. I liked the proposition that it brought back nostalgic memories of WWII, especially when sweets were in short supply. Great article, thank you for sharing! The pictures were a really nice touch! It’s great to hear about how something so unused in America is a daily ingredient for Russia. Just shows how different foods are around the world! It was a really interesting article to read. In México condensed milk is really popular we mostly know is la lechera and it is delicious! I liked how you also introduced the history of condensed milk in Russia, it really brought a nice touch to the article. Reading about this made me really think about how different cultures and traditions use food in different ways. People in the US don’t usually use condensed milk unless it’s an ingredient in a recipe. It’s cool to see how people use the same things in vastly different ways all over the world. Wow that’s amazing on how many ways you can use condensed milk. My family has never used in cooking. I am very curious to use it in my cooking! It is interesting to find where sweetened condensed milk was first invented and how it got popular throughout the world. I grew up eating dipped bread in condensed milk. It was one of my most favorite childhood snack. Reading your article reminded me of the happiness I would get when I came home from school and saw a brand new can of condensed milk sitting on the counter! I usually would be the one in the family to consume the whole can within a few days or to be honest, a few hours. Thank you for sharing about the history of condensed milk! Now I am more aware of where my favorite bread dip was invented. It’s interesting that what can be an everyday thing to some can be considered a delicacy in other countries. I guess I never knew this about condensed milk. It reminds me of Spam in Hawaii. While I don’t think they consider themselves to be pioneers of canned ‘meat’ (who wants to be that? Sweet milk is a much more appealing product) it was brought there during WWII by soldiers and consumed by locals because it was cheap. To be honest with you I have herd of sweetened condensed milk but to I don’t really know if i have every used it. After reading this and especially after looking at the pictures i might have to go buy some, because it looks really good. I really like how you explained how it became popular, very nice touch to an already great article. It’s fascinating how something like this can be so globalized. 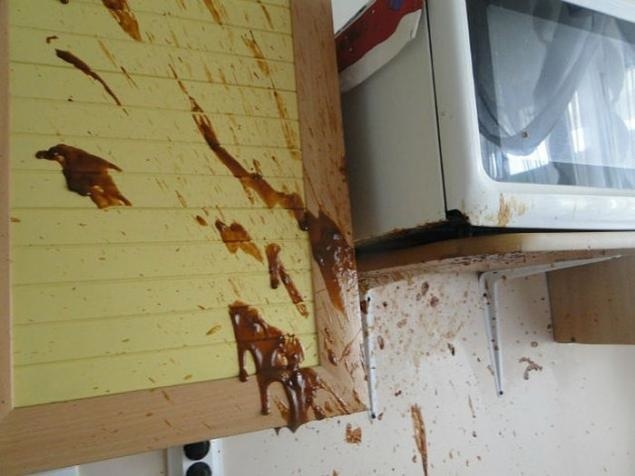 We usually just use sweetened condensed milk to make hot fudge, and I remember my Spanish teacher making a few desserts with it during our food unit. I never would have thought that it was so widely used in other parts of the globe. This type of report is my favorite as you took a subject that most would deem extremely boring.. condensed milk and made it a really fun and interesting read with its history and also the varying uses in Russia. The condensed milk history reminded me of spam, as this was another war staple that became popular due to its shelf life. Is varyonoe sgushyonnoye moloko worth giving a try or should I stick to buying caramel sauce in a jar? I have condensed milk a few times, dipping cookies, and have been looked down upon. Next time this happens, I will point them in it to this article! Very cool article showing how food has different standards throughout the world! Thanks for sharing! I like how you symbolize the milk at the end. I am also very eager to try some! Thanks for sharing! My mother uses sweetened condensed milk as well in her cooking. I think that it is interesting how popular it is in Russia. I’ve never thought about the history of sweetened condensed milk, I wonder if we go through another war, do you think we as a country would resort to using condensed milk again? It is an interesting treat that I have never even heard of before. Even more interesting is the history behind it in the American Civil War! It is amazing to see how something is popular in Russia and Colombia, it shows how humans have much in common in terms of wiring and taste. This certainly was a reminder of my teenage years! 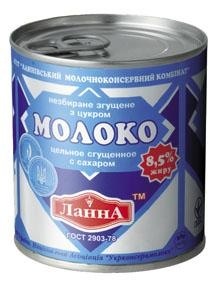 My father married a woman from Khabarovsk, and her and her daughter absolutely LOVED sweetened condensed milk. They put it on everything! (It’s so good on toast!) It’s amazing what we consider certain luxuries dependent on the environment we live in. Neat! First off, hats off to your amazing photos and I hope it wasn’t too much work to clean up! I think your article was very interesting to read and I could hear the joy in your voice as you described this delectable food. You inspire me to want to start cooking especially with this new tasty ingredient you decided to share with us. Apparently I have only had condensed milk once. I was probably in my 4th grade, and never after that! I still remember the taste though and as I was reading this article, my mouth was watering… I never bothered to ask myself how this nice stuff got to Zimbabwe. Thanks for sharing. Very interesting article! I don’t think that i have ever actually tried condensed milk, but by the sound of it, it seems quite appetizing. It’s amazing how many hidden foods there are all over the world that everyone should try, and there are basically unlimited amounts of different food combinations. Great article, Marin. Acknowledging the stories behind commonplace items, such as condensed milk, is such an incredible way to explore history and provide an interesting context to something we may never think about. This is a cool story as I did not know that condensed milk was consumed in any other way other then for baking. I like that you were able to provide a background as to how condensed milk first made its debut. It’s neat to learn all the different ways each part of the world may use something in other ways than we do. It was interesting to learn different ways to use condensed milk. Also, your pictures and talking about food made me very hungry. Thanks for sharing. I can remember my grandmother baking with sweetened condensed milk when I was little and after the can was empty letting me try some. Even though it tasted delicious she reinforced the idea that it was for baking, so hearing how the rest of the world does not view it in the same way is amazing. I love how it was created more as a way to stop illness rather than a to be a sweet, food origins have always interested me. I think the next time I am at the store I will have to buy some to try drinking. This is a great article. It shows wonderfully the differences between cultures when it comes to food. Even though this product has spread through globalization, we all use this product in different ways and different times. I can remember my German grandma using this when making Christmas cookies, but that is the only time I remember ever using it. This article just shows how when there’s too much sweetness, it can also be dangerous!! 😉 Personally, I am a fan of condensed milk, especially in cooking. Learning about the history of the product and putting a more deep meaning to the household item was enjoyable to learn about. Next time I cook with condensed milk this article will help me associate a meaningful story/history behind the well-loved milk. My memories of sweetened condensed milk involve rifling through the cupboards looking for a can of soup or something tasty and to my dissatisfaction only finding a lonely, unused can of milk that wasn’t fit to drink like other milk. I curiously clicked on the article because I was intrigued to see what sort of article someone could create on such a product. It immediately alerted me to my naivety. I was intrigued to find the dynamic history of the product in both a scientific and food perspective, since it was used as a preservation tool and food staple. It was also neat to see that it was heavily influenced by war, much like the Australian Vegemite. This article makes me want to look into the history of food and war. Thanks for sharing! Hello Marin, I must admit that I have never tried sweetened condensed milk myself, but it does sound rather delicious! I wonder if that is simply because my own family has never prioritized it in terms of my families shopping list, or if my parents do not enjoy it, so they never shared it with my brother or myself. I find it fascinating that sweetened condensed milk was developed at first for practical reasons (in terms of storage) and then later became a hit during wartime, as it would last for a long time. I have made one friend at The College of St. Scholastica who is an international student from Russia; I will have to ask her if her family enjoys sweetened condensed milk as well! This article is a few years old now, but I’d still like to take the time to thank you for writing it, Marin. I think it is very interesting to see sweetened condensed milk as a beloved food. For most of my life, I didn’t actually know what it was, but even now, I only really recognize it as a sweet ingredient to add to something being baked. The variety of uses you explain here is very different, especially on blini (a food which I adore with nutella or jam). However, I tend to find sweetened condensed milk to be too sweet, even in particular cake recipes, so it makes sense to be used as a supplemental treat during times where other treats were scarce. With the fast and fierce onset of globalisation, it is interesting to see something like this continue to be a staple in Russia, but I’m even more surprised that the US doesn’t have more recipes or ideas to use sweetened condensed milk considering the flow of ideas internationally. I’m curious to see whether or not the US will embrace more foreign recipes and traditions or if we will be stuck in the ways we’ve developed. How would we even survive in the US now if we didn’t have all of the global ingredients and services at our beck and call? Who knew people used sweetened condensed milk in so many ways…. I have used scm in many recipes, and have thought about making the caremel (although I am afraid of the potential disaster). Thank you for sharing the history of scm. I never realized that it was such a huge war staple. That was very interesting to me. Also, thank you for sharing the popularity of scm in Russia.